Thanks to all of you who suggested such awesome boy-friendly handmade gifts on my last post. For those of you who missed it, do check out the comments on this post. There are some really inspired ideas that might help you out with your own handmade holiday gift list, whether for boys or girls! The photo left there shows some felt crowns in progress for some of the littler people on my list. I got the pattern out of Creative Family, but tweaked it a bit. Even nicer for our family in particular is that this list inspired not only me but also my two older daughters to brainstorm handmade gifts for everyone we could think of! I was so proud of my ten-year old especially. Not only did she come up with some lovely ideas for family members, she actually got started making some of them. I swear, at one point I left the room for a few minutes and when I came back she had strung up a necklace for my mom’s gift already! Then a few minutes later, she had drafted a stuffed toy pattern for her baby sister and was all ready to go upstairs to choose fabric and bust out the ironing board! Those of you out there who know my oldest know that it is hard indeed to pry a book out of her fingers and get her off her preferred reading spot on the sofa. She tends to lose steam with craft projects pretty quickly, but this time she was so excited. The sheer variety of making possibilities is what did it, I think. Here’s hoping that you and your families all had similarly inspired weekends! It feels a bit premature with our thermometers here in NC still recording temperatures in the upper 80’s and 90’s, but I’ve begun thinking about Christmas gifts. Stephen and I have resolved this year to end the spending free-for-all that seems to happen each winter despite our best intentions and to make all our gifts this time around. That means whatever the mercury says, I need to get crackin’! The hard ones on my list are my two little brothers. They’re 8-year old twin boys, waaaaay into the plastic junk from China, thanks very much. So what in the world am I going to make these guys? Maybe a guitar strap for the one who’s just started taking lessons? Perhaps some handmade books for drawing? (Thanks to Soulemama for that idea.) If y’all have any suggestions, feel free to send them my way. I always want to give gifts that please the recipient, but when I’m going to the trouble of making that special present–especially if the recipient is a young’un not known (ahem) for their diplomacy–I really want it to be something pleasing. Anyone else out there done any successful handmaking for boys who prefer plastic? Thrift shop score makes a mama and a girl happy! I wrote recently that running a craft-related business left me with little time to do any sewing of my own anymore and…well, that made me a bit grumpy for a few days, I must confess. So when I found myself this weekend with only a sleeping baby in the car with me to keep track of and knew that she would stay asleep (transferred to her stroller, of course) if I ran a quick errand, I headed to a nearby thrift store to rustle up some vintage sheets! Scouring the bins and racks at the thrift shop was something I enjoyed very much in college. I had tons of free time before my kids were born, very little money, and a taste for old stuff that wasn’t just like everyone else’s stuff. As a busy mama to three girls, though, it’s been some time since I had the time required to score the good stuff. You avid thrift shoppers out there will surely agree that you’ve gotta have time to really go through things. Anyway, I wasn’t sure if, with all the crafting going on around me locally these days, there’d be much in the way of vintage anything left to score. But guess what–there is! I got a great haul of eight vintage sheets plus a pillowcase. It totally made my weekend! Even better was that I had the time to actually make something from my haul. 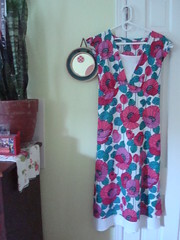 Check out my middle girl’s new pilowcase dress, made up from Red Instead’s easy instructions. If I hadn’t needed to patch the pillowcase in a couple of places because of some unnoticed worn spots, I bet this would have gone together in less than an hour. I was dismayed when I saw the yucky worn spots, but was inspired to do some applique patches after running across this tutorial on the Sew Mama Sew! blog. 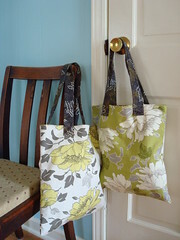 They’re made from some fussy cut Kaffe Fassett flowers and now I’m glad I needed to add them! Send us your Spoonflower projects! I’m putting together a slideshow of some of the nifty projects we’re seeing made from Spoonflower fabric. Most of what I’ve assembled so far is from our (amazing) Flickr pool, so if you’ve posted a project photo there then I probably already have it. Likewise, if Kim has blogged one of your projects I already have that as well. But if you would like to share an as-yet-unposted project made from one of your own fabric designs, by all means email me a link or a photo I can use in the slideshow. Thanks! Another busy weekend, but this time it was because of sickish kids. There’s been a whole lotta boogie-wiping going on here lately, and everyone three and under is cranky and sleepless. Isn’t it amazing how sick kids can bring everything to a near standstill? As it should be, I suppose. I did manage to get a simple sewing project done, though. Soulemama reminded me in a recent post that I, too, have these Japanese sewing books with tons of little girl clothing projects I’ve been meaning to get around to. I put them on hold awhile back because the weather was too cool to make them urgent. Today though? 90 degrees outside and this little tie shoulder top is perfect for my middle girl to stay cool in. Anyone else out there have school-aged children? I’ve got a 4th grader and it all of a sudden hit me this morning that with the end of the school year fast approaching on June 6, I’ve got a couple of teacher gifts to figure out. Wouldn’t it be nice to make some thank you presents for a change instead of going the box of gourmet chocolates route? Of course it would. Earlier this school year, I made a set of cloth grocery bags for the school’s silent auction fund-raiser, loosely based on one of the cloth totes in The Impatient Patchworker . (This is a great book, by the way. Jayne Emerson, the author, doesn’t have the blogosphere cred that some crafty authors do, but who cares? I like an approachable craft book, and she uses a whole lot of Kaffe Fassett fabrics to make up her projects. How can you go wrong?) Anyway, I made the bags from some Amy Butler prints I had on hand. They were pretty well received, so I may make something similar for my daughter’s teacher and assistant teacher. Teachers always seem to be lugging around a ton of stuff, right?